Advanced Auto Fabrication offers a service we call “Arrive and Drive”. The Arrive and Drive service can be the next crucial step forward in honing in your driving skill set. What is Arrive and Drive? Before a race event, AAF will take your car and perform a thorough pre-race inspection. We will make sure that your car is in top-shape and ready to race. This means your car will be ready and waiting for you at the race track! During a race event, AAF will continue to take care of your car. Should your car suffer any mechanical failures, we have highly experienced tech’s on the scene. Once AAF sets up shop at the track we will have tents to cover cars from sun or rain, and have trailers designated for drivers and crew. Here is the best part! While the AAF Crew is readying your car for the next heat, you can stay relaxed in a heated or air conditioned technical trailer. We set up the tech trailer for data analysis. Crew Chief and Owner, Hank Moore, can help you analyze data from your car. He can either give you driving advice or make decisions on changes we can do to the car to get the most out of your weekend. After the race event, AAF will then perform another thorough post-race inspection. 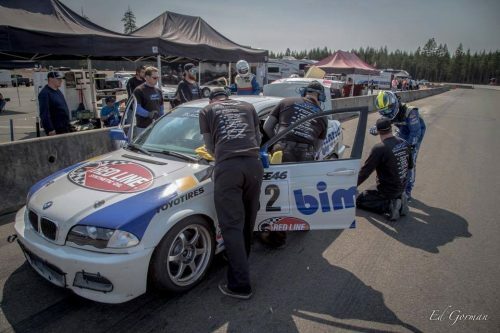 Checking every race car soon after a race is critical to be able to order parts, perform general maintenance, or install upgrades before the next race event. No matter where you live or where we’re racing, all you need to do is ARRIVE and DRIVE!